We embarked on this project with a clear question: Who wrote the different chapters from the novel The Dynamiter? However, this question only gave way to more questions: Was The Dynamiter a true collaboration between the Stevensons? Was it all Robert Louis’s work, or did Fanny write the chapters she reportedly authored? But, perhaps most importantly: Were these even questions we could hope to find out? This is an overview of the different stages of our analysis of The Dynamiter (for a more detailed explanation of our methodology, see here). In her preface to the 1923-24 Tusitala edition of The Dynamiter, Fanny explains how The Dynamiter was written.1 This is just a personal account, and as such it is not entirely reliable. Be that as it may, the preface provided us with a starting point. This account of the events, however, only sheds light on “The Tale of The Explosive Bomb,” which is explicitly described as being Robert Louis’ idea. Even if tales such as “The Tale of The Destroying Angel” were originally Fanny’s idea, concocted during her promenades through the French countryside, Louis could have penned the final, printed version. The Tusitala edition in which this account is recorded states, in no uncertain terms: “Stevenson and Mrs. Stevenson collaborated in The Dynamiter. Mrs. Stevenson was entirely responsible for the stories of The Destroying Angel and The Fair Cuban.” That would mean that the rest could be entirely Stevenson’s, or, perhaps, that they collaborated more organically in the writing of the tales. But it could also be inaccurate information. Lastly, on the preface to the Scribner biographical edition of New Arabian Nights, Fanny states that Robert Louis’ cousin Robert Alan was the inspiration behind many of his characters, and, among them, The Dynamiter’s Paul Somerset,6 which could indicate “Somerset’s Adventure” was Louis’. After collecting this information, we drew up a table of contents (see below), and began our research. One thing that needs to be understood about our process is that it was entirely based on trial and error. 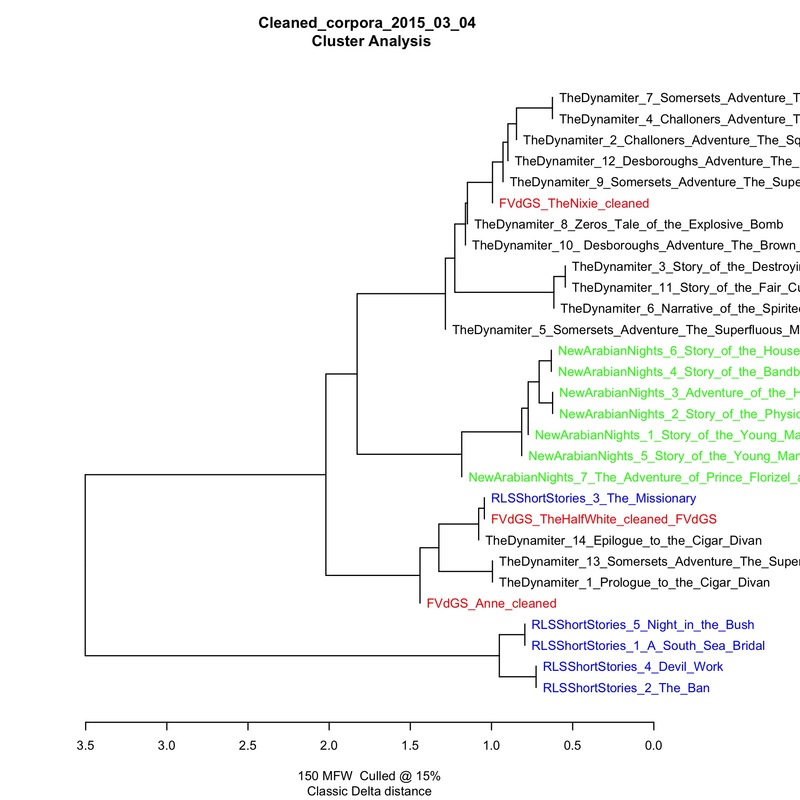 The first few analyses we ran were not only inconclusive, but misleading. At this stage we had a very limited corpus, containing only The Dynamiter, New Arabian Nights, some chapters from South Sea Tales, and a total of three shorts stories by Fanny (see Cluster Analysis example above). The results we got, at this stage, looked very messy, thanks in part to some arbitrary culling percentages (15% or 20%). We were working under the preliminary assumption that the information we had collected was correct, to some extent. We thought that Fanny was the author of “The Story of the Destroying Angel” and “Fair Cuban”, that “Somerset’s Adventure” was Robert Louis’ story, and that the rest was yet to be discovered. This is why we were so happy to see results like the ones above: “The Story of The Destroying Angel” and “Fair Cuban”, at least, seemed to belong to the same author. However, we also recognised the fact that Fanny’s stories (in red above) were too scattered across the graph, and that we needed to both increase her comparative corpus and to understand the software we were to use. After our first few analyses, we started to develop a more nuanced strategy. It was at this point that we also began to understand to what extent we were limited by Fanny’s small corpus, which barely scraped 42,000 words. For comparison’s sake: The Dynamiter alone is a total of 75,246 words. We collected all the stories by Fanny we could find, but some were too short to include. At this point we could run tests on Stylo ourselves, and we found out that using 2,500-word samplings would invariably group the stories incorrectly. In fact, it was not until we started using 4,500-word random sampling that the software would return consistent results. This posed a problem, considering that some of Fanny’s stories were below the minimum word count. We had to make an executive decision: either leave the too-short stories out of the analysis, or group some of them together. We tried putting some together to increase the word count, but we soon discarded this practice: Fanny’s short stories were meant to be taken as discrete units, and we couldn’t justify our grouping them together. This left us with a dramatically reduced comparative corpus. When trying different parameters, random sampling seemed to give better results. We also used David Hoover’s “Testing Burrows’s Delta” as inspiration. Hoover maintained that removing pronouns would yield better results,7 which, incidentally, seemed like a fitting measure given that we suspected that the female narrators in “Story of The Destroying Angel” and “Fair Cuban” could be skewing our results. 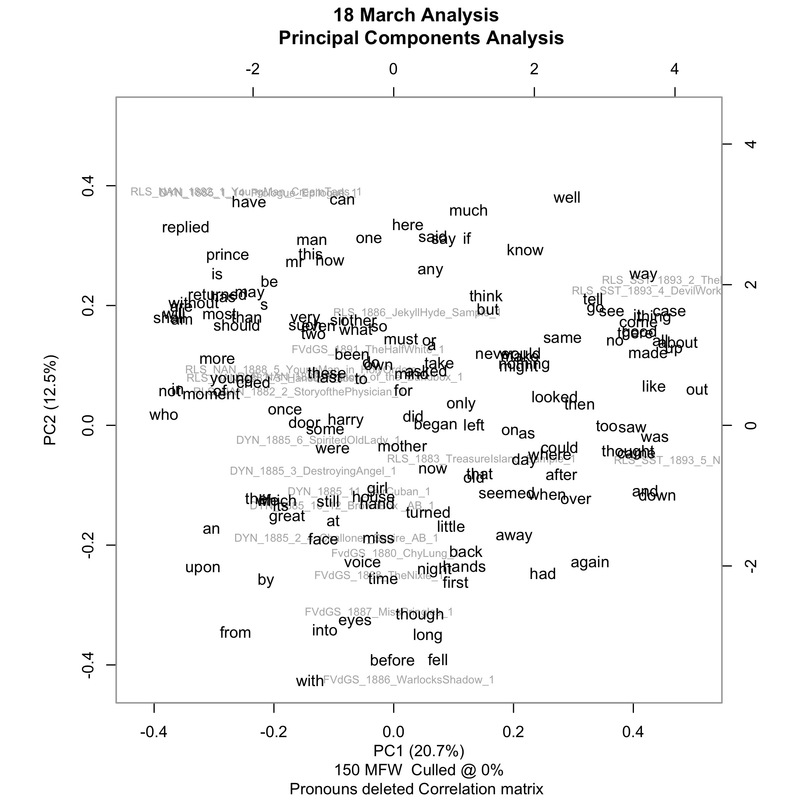 According to Hoover’s findings, the higher the MFW (Most Frequent Words), the more accurate the results.8 However, we had to be careful about using a MFW that was too high: given the (generally) small samples we had, and the fact that we were not culling, using a too-high MFW would mean using far too large a portion of a text. We strived to find that sweet spot in which results would seem mostly coherent but some things would remain undecided, as these would point to the most interesting samples, and the ones we should investigate further. We started getting unexpected results for several stories. You can read more about them in The case of Chy Lung and The South Sea Tales. The way we approached The Dynamiter also changed significantly at this stage. We were, once more, faced with an uneven corpus—the chapters from The Dynamiter, much like Fanny’s stories, have very different word counts, and some of them fell below the 4,500-word mark. We tried different things. For example, we separated the novel into 5,000-word samples, and we also took the chapters as discrete units, but the results were unsatisfactory. Here our background as humanists came into play. Even though our project did’t involve close reading of the novel, we knew that the structure of The Dynamiter was like a Russian doll: it contains relatively standalone tales which in turn are embedded in frame narratives (bigger dolls, as it were). Even though these frame narratives are separate chapters, they are clearly connected thematically and stylistically, and the scarce secondary literature we found referred to them as if they were whole units. Therefore, we decided to group the frame narratives together. But our results were not following the pattern we expected them to. If in the previous stage we found that “Story of The Destroying Angel” and “The Fair Cuban” seemed to be written by the same person (presumably by Fanny), the results at this stage made us question this assumption. “Story of The Destroying Angel” and “The Fair Cuban” still appeared, more often than not, close to one another—but so did most of The Dynamiter’s chapters. This could mean that the whole book had been written by the same person, of course, but it could also point to mistakes on our part. Therefore, we had to leave some of our humanist tendencies behind and stop trying to find what we wanted to find. We had to heed the results, like scientist would, and adjust our method. One of the results that surprised us the most was the fact that “Squire of Dames” started appearing closer to Fanny’s writings. We thought we had found a clue in the graph above. Even though content words are not supposed to skew results too dramatically, we realised that “miss” was one of the words the PCA had picked up on. In “Squire of Dames”, one of the characters, Challoner, walks Clara Luxmore, another character, through London. We wondered if the presence of a woman in the chapter could be placing “Squire of Dames” closer to Fanny’s writings, since she favoured female characters, contrary to Robert Louis. This is why we decided to remove all content words from the analysis and concentrate on function words, which, according to the scholarship we had read,9 were the most consistent clues to authorship. One of the last key changes we decided to implement was to use the same most-frequent-words tables we would get from Robert Louis’ and Fanny’s corpora (without The Dynamiter) for all the remaining tests, which helped us get consistent results. Furthermore, and following Binongo,10 we decided to use no sampling instead of the previously adopted 4,500-word random sampling so we could include shorter texts in our corpora. Consistent, however, doesn’t mean clear. Some chapters seemed to behave strangely, and, for example, “The Brown Box” and “Spirited Old Lady” would often appear grouped with Fanny’s stories. In the example above, “The Brown Box” appears close to “The Fair Cuban.” These chapters, in turn, appear close to Fanny’s “Chy Lung, The Chinese Fisherman.” Similarly, “Squire of Dames” is grouped closer to Fanny’s stories. We decided on a series of final adjustments, and we resolved to go back to treating each chapter of The Dynamiter as a discrete unit, exactly as we did with Fanny’s stories, and we divided Robert Louis’ comparative corpus in 5,000-word samples. Looking at our results, we were reasonably confident we would be able to offer several answers at this point. 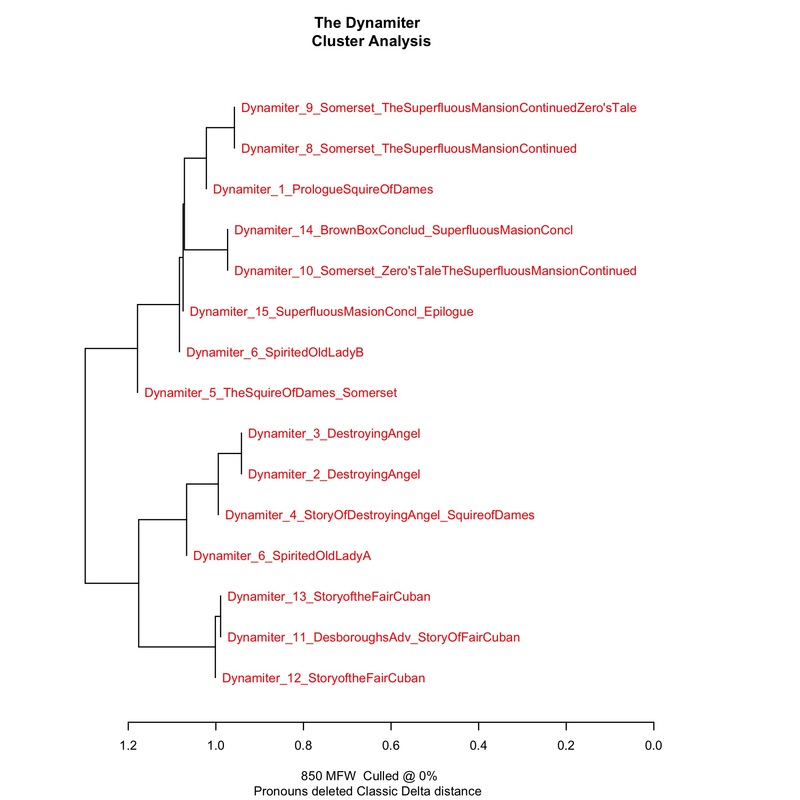 To read our conclusions, see: Who wrote The Dynamiter? Van der Grift, Fanny. “Prefatory Note.” The Dynamiter. By Robert Louis Stevenson and Fanny Van der Grift. Tusitala. III. London: Heinemann, 1923. Print. 35 vols. Van der Grift, “Prefatory Note”, xi. Van der Grift, “Prefatory Note”, ix. Van der Grift, “Prefatory Note”, xii. Van der Grift, Fanny. “Preface to the Biographical Edition.” New Arabian Nights. By Robert Louis Stevenson. 1882. New York: Charles Scribner’s Sons, 1905. Print. vi-ix. Hoover, David L. “Testing Burrows’s Delta.” Literary and Linguistic Computing 19.4 (2004): 456. Hoover, “Testing Burrow’s Delta”, 455. Juola, Patrick. “Authorship Attribution.” Foundations & Trends in Information Retrieval 1.3 (2006): 320. Binongo, José Nilo G. “Joaquin’s Joaquinesquerie, Joaquinesquerie’s Joaquin: A Statistical Expression of a Filipino Writer’s Style.” Literary and Linguistic Computing 9.4 (1994): 267–279. Web. 19 Mar. 2015.